Photo by Optical Illusion. cc Some rights reserved. I expect this year to be an exciting one for mobile browsing and mobile web apps. 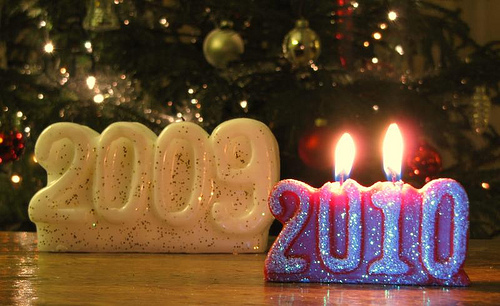 Here are my predictions of what 2010 will bring to mobile web sites, services and browsers. Traditional mobile web sites will start to disappear – prematurely. With interest and development effort centered around the middle-web, publishers and developers will tend to neglect their legacy mobile sites. This will be a mistake. Even though the handset replacement cycle averages 18 moths in the US and Europe, old phones live on for five years or more in the developing world. Case in point, according to AdMob (PDF), the most popular handsets in Indonesia are the Nokia N70 and 6600 which are five and seven years old. Developing markets are also where mobile traffic is growing the fastest; according to Opera betwen Nov 2008 and Nov 2009 Opera Mini page views increased by 604.5% in Indonesia, 445.3% in South Africa and 1091.1% in Vietnam. Those increases are on top very significant traffic volume as the three countries are in the top ten in the world in overall Opera Mini traffic. Mobile data plans will change and not always for the better. The iPhone made browsing and connected apps on phones fashionable, especially in North America. The usage of and the demand for mobile data has risen dramatically among both smartphone and feature phone users. Users are clamoring for more and cheaper data, However, many mobile operators somehow failed to anticipate that demand and build out their networks to meet it. Users on AT&T, the exclusive iPhone operator in the US, are increasingly plagued with dropped data and voice connections. The operators most impacted by their own lack of foresight will cap, cut back and increase the prices of their data offerings. Less impacted networks will see the rising demand for data an opportunity for growth. Expect to see some innovative low cost and data offerings from operators who still have surplus data capacity. These will tend to be through MVNO’s so that they don’t cannibalize revenue from current customers locked into higher cost plans by contracts. A couple of examples have already appeared; MVNO StraightTalk‘s $45/month unlimited voice, messaging and data plan on the Verizon 3G network and a $40/month unlimited data-only offering from DataJack, a MVNO using T-Mobile USA”s 3G network. There is some doubt about DataJack’s legitimacy, but StraightTalk is real, owned by América Móvil, the 4th largest mobile operator in the world, and sold by WalMart, the nation’s largest retailer. Apple’s tablet will revive the MID. Apple’s product will have a wonderfully intuitive user interface and gorgeous industrial design. It may even include some “killer” new feature like “insanely great” voice recognition software. But it will be expensive, locked down and likely limited to a single operator if it has mobile data support at all. But it will be fashionable, popular and will spur a rash of clones. Many of which will be keyboard-less netbooks running Windows 7, but some will use the Android or Chrome OSs. More Android, Symbian and Maemo, less iPhone. Apple has the potential to revolutionize the mobile scene again in 2010 but the competition is catching up. It will be harder for Cupertino to grow or even retain its market share this year. Android in particular is reaching critical mass. Its been adopted by every major manuafacturer that doesn’t have its own smartphone OSs. The latest Android devices like the Droid and Nexus One meet or exceed the iPhone in speed, screen size, resolution and just about every other capability except Apple’s unmatchable ease of use. This entry was posted in Predictions and tagged 2010, Predictions by Dennis Bournique. Bookmark the permalink. I think this article is great but very biased. Anyone who under estimates Microsoft’s ability to catch up is making a mistake. Remember Netscape! I think that Microsoft see this opportunity slipping away and they are about to invest huge money to make a come back! I feels that android will boost up, mobile browsers will break all boundations and a clear war among desktop browser. Great post Dennis. We are already seeing Android ramp up in share in the latest admob stats. Open source OS will certainly get a boost in adoption this year.Players like Symbian,Android and probably Bada will be magnets.To catch up with these sophisticated systems,mobile hardware will go through a metamorphosis (whopping 100GB storage,1.5 GHz processors,PM-OLED and MEMS display technologies,etc. ).Further,the number of players in mobile manufacturing industry will increase in developing geographies creating a fierce competition ecology.